Voices for Creative Non-Violence and the Afghan Peace Volunteers have had an extremely busy 2015. In Kabul the APV have expanded their street kids project to take on 100 children from the area of Karte Se, providing them with an 'alternative education' program (which includes learning about the power of non-violence), organising protests for equality and the right to education, as well as holding a soup kitchen for local unemployed labourers (who currently include some of the 40% currently unemployed in Afghanistan). 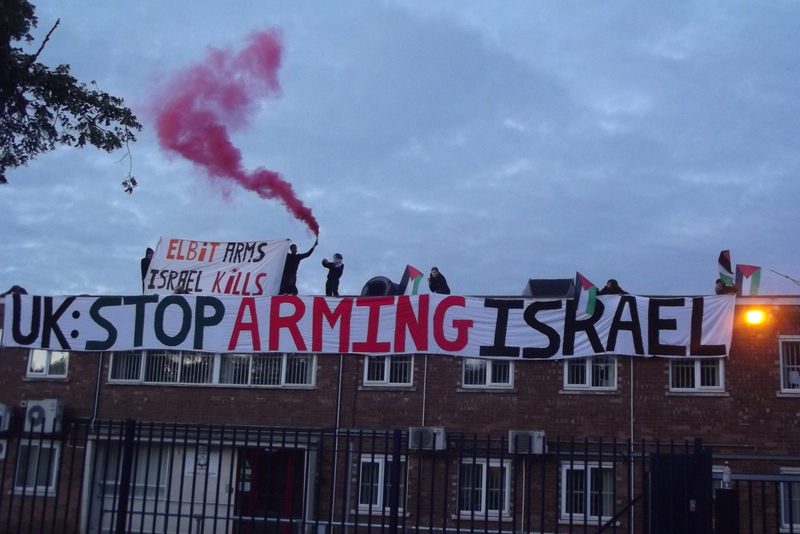 In the UK we have been opposing the proliferation of weaponised drones with our core planning participation in resisting the advances of Elbit Systems (manufacturer of the Hermes 450 drone, and one of Israel's top arms dealer), by fending off advances made by the company to injunct and then prosecute the rooftop occupiers - we won that battle. We've also been central to the creation of the Fly Kites Not Drones education pack, working with members from the Peace Education Network in designing and trying out exciting workshop materials for young people between the ages of 8-18 years. The pack facilitates young people to understand the impact and morality of weaponised drones, as well as empathise with other young people who live under the terror of military drones. The response has been fantastic, the combination of interactive educational workshops with the creative and fun aspects of making and flying kites has really taken off! In the next few weeks we will be sending another peace delegation to Kabul. As usual we will bear witness to the impact of 14 years of aggressive foreign policy by the US & NATO, as well as work with, and be in solidarity with the Afghan Peace Volunteers. Delegates will include Ellis Brooks of the Peace and Social Witness Education Department, who will be running peer mediation workshops with the 100 street kids, equipping them with the tools to enable them to resolve arguments and conflicts within their peer groups. We are really looking forward to seeing the Duvet Project enter its 4th year, a grassroots initiative run by the mainly teenage membership of the APV, providing some of the poorest in Kabul with extra warmth over the extremely icy winters, as well as employing 60 local women (from various ethnic groups) to make the simple but effective duvets. 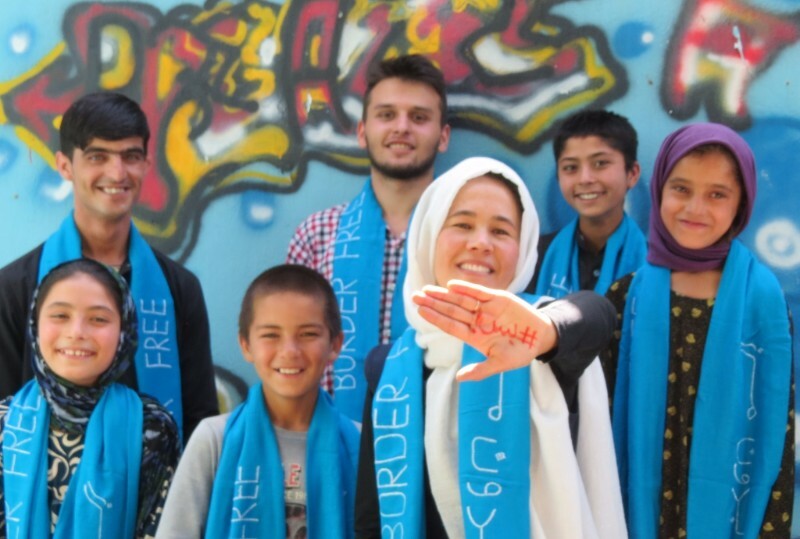 Membership of the Afghan Peace Volunteers has steadily increased over the last year, they now have projects and campaigns which range from the mixed ethnic football team to the flashmob dance troop, as well as running international campaigns such as #Enough! and maintaining their monthly communication with the world via Global Days of Listening. We have also been working in solidarity with other campaigning groups, such as Shut Down The Arms Fair, Movement for Justice, London Palestine Action and Wheel Stop Trident; as well as maintaining our commitment to the steering committee of the Drone Campaign Network and active membership of the Peace Education Network, while undertaking speaking engagements to whomever, where ever. By way of 'taking a break' we have participated in 2 international solidarity peace walks: one across Wisconsin connecting racist shootings by US police with the use of racial profiling of drone targets, and then most recently, a walk against US bases in Okinawa. Next year we continue to maintain our pace of work, while also including an additional strand of working with the Afghan diaspora in the UK. 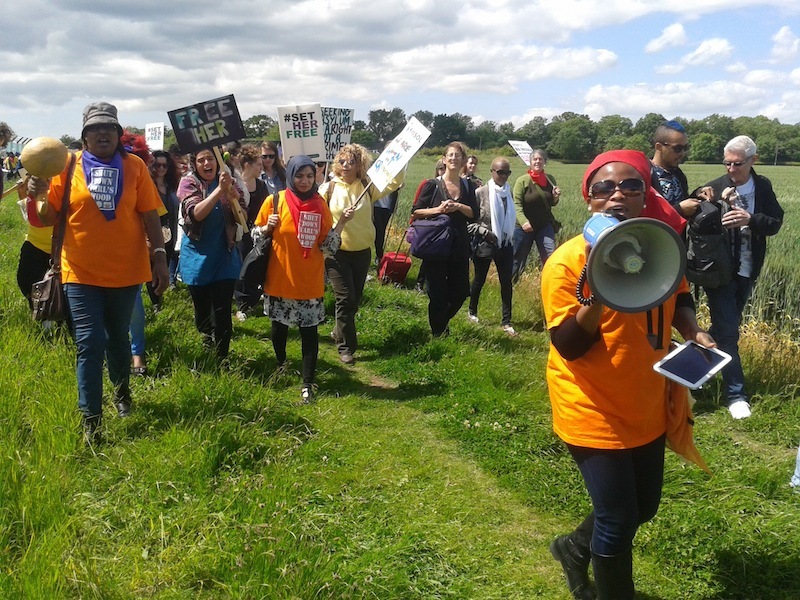 This includes running workshops which tool refugees/ asylum seekers with activist skills to help with enabling them to voice their stories and grievances through the medium of campaigns. 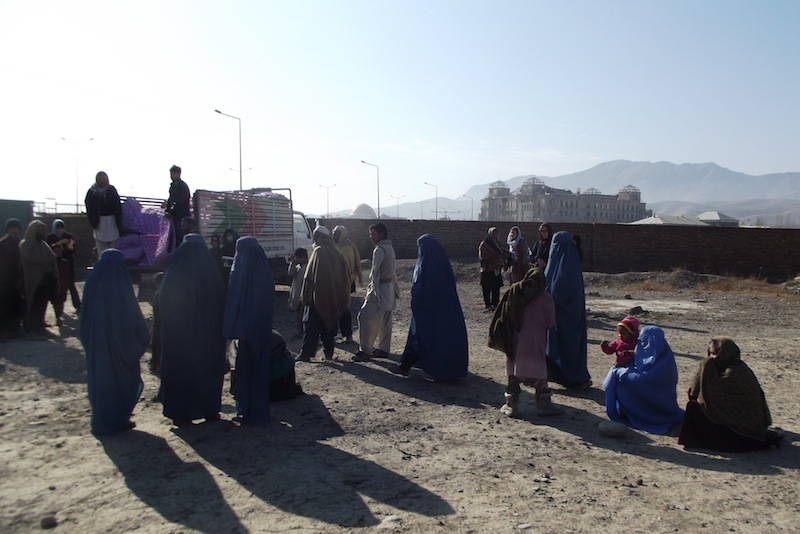 We will also be working with British Afghans, community groups and organisations. All of our busy work requires kind donations from our wonderful supporters. Would you, or your friends, or your friend's friends like to donate to an extremely worthy grassroots cause? 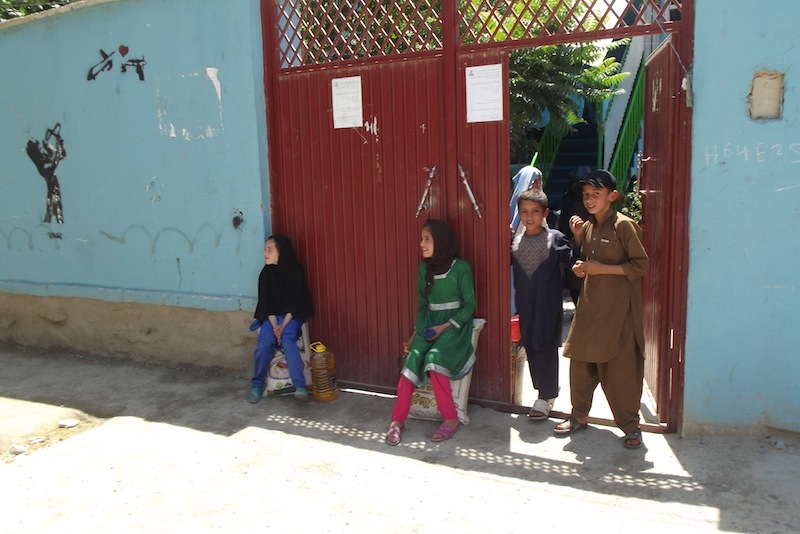 We directly send funds to the Afghan Peace Volunteers for their street kids and duvet projects, as well as to help pay the rent on their 'Borderfree' peace centre. We also need core funding for the less exciting costs of internet, phone and travel expenses. You can specify which area you would like your donation or standing order to go to by referencing it with the bank, or writing on the back of the cheque. Providing education, a food subsidy, and opportunity to 100 street kids. It costs £350 to put a street kid through the project for one year. A sack of rice and a container of oil per month for one year costs £310. School materials and winter clothing per kid costs £40 per year. Please reference 'Street Kids Project' on cheques and bank payments. 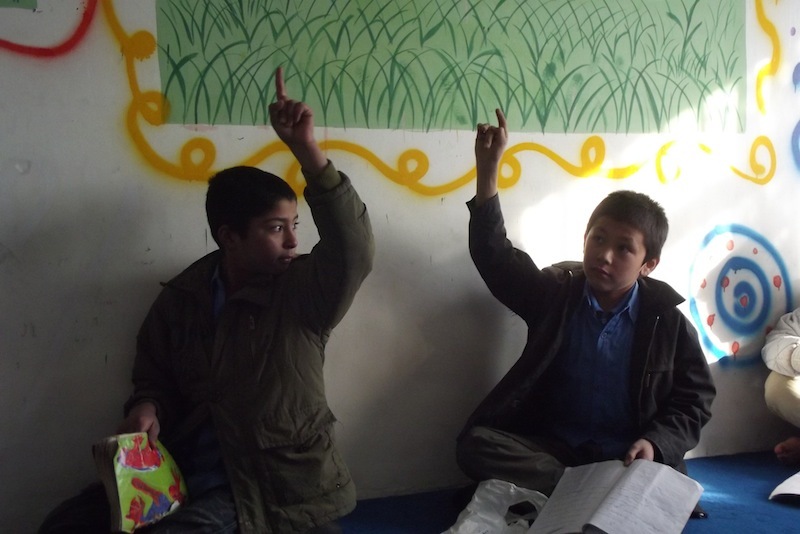 Street kids in thier literacy and numeracy class, the project also provides an 'alternative education' in non-violence. 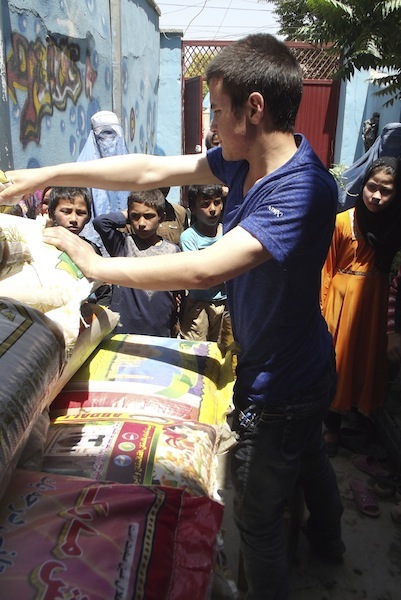 Street kids, with their rice and oil, outside the Borderfree Peace Centre in Kabul. 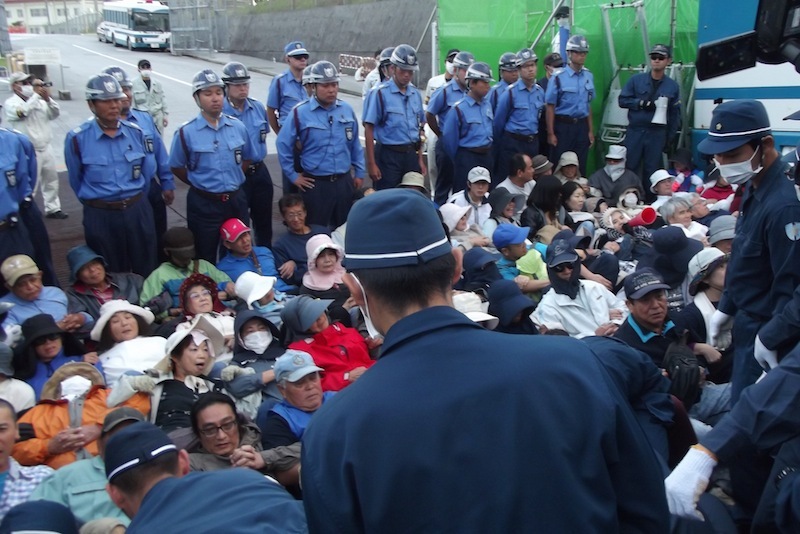 In 2015 VCNV also worked in solidarity with many other groups. Attending events at Yarls Wood Detention Centre where refugees and asylum seekers are indefinitely held in "prison" conditions. Closing down UAV Engines for 2 days, and rebuffing various attempts of prosecution, including an injuction and a law suit for damages. We also desperately need core funding for the not so exciting jobs of admin and organsing, without which, nothing is possible! VCNV worker Maya Evans hard at work with admin. 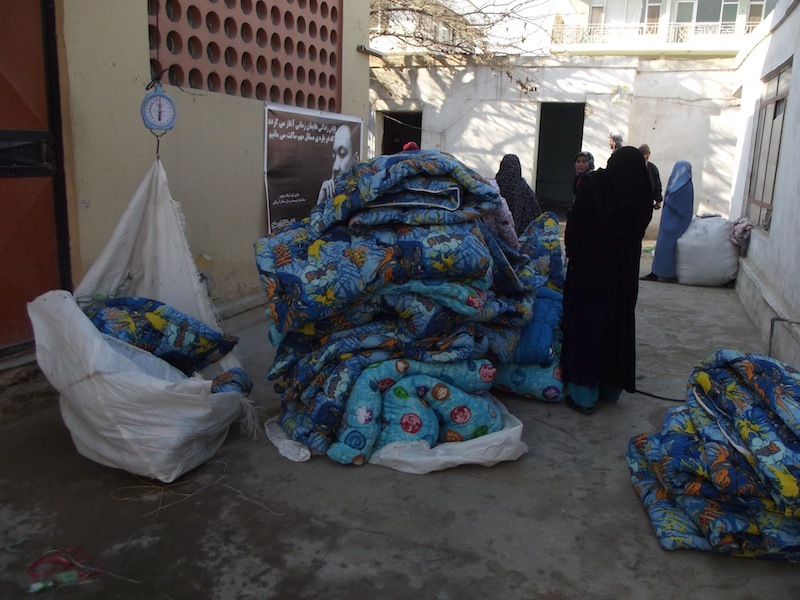 Providing warmth to some of the poorest in Kabul, and a basic income to 60 women. The APV are aiming to distribute 3,000 duvets this winter. The project has already made 9,000 duvets over the last 3 years. Each duvet costs £8.70 to make, each family is allocated 2 duvets. Please reference 'Duvet Project' on cheques and bank payments. Weighing of the materials for the 60 women who are paid to make these essential warmth giving duvets. While cycles of violence around the world continue to play out and deepen, the APV launches #Enough! campaign, confirming their conviction to non-violence in the face of further wars. Support them by buying a handmade Borderfree blue scarf. 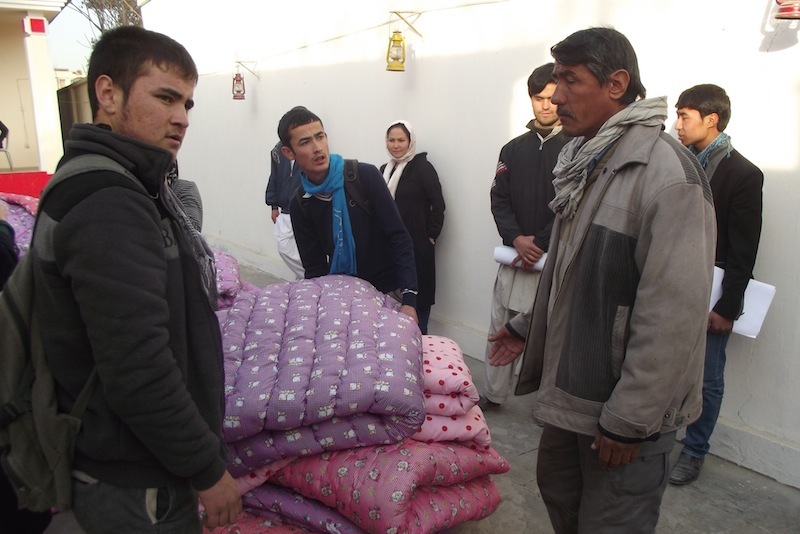 Distributing duvets to local unemployed labourers. 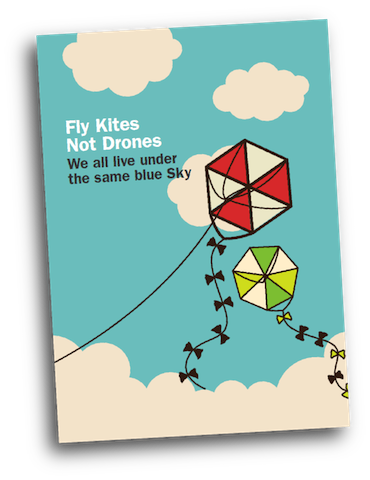 We have been working closely with members of the Peace Education Network to produce this peace education pack about drones, which is available to download. 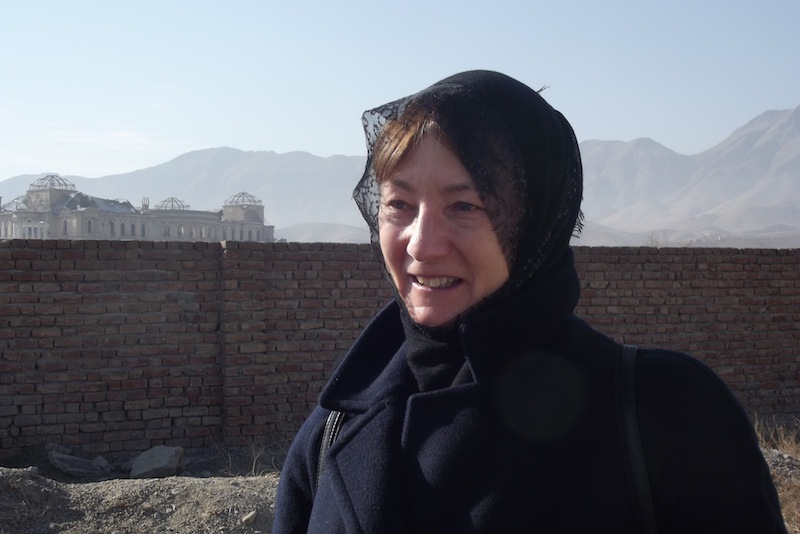 Mary Dobbing, a core member of the group, is currently unwell and in Bristol Hospital. Photo above was taken earlier this year when she travelled to Kabul. 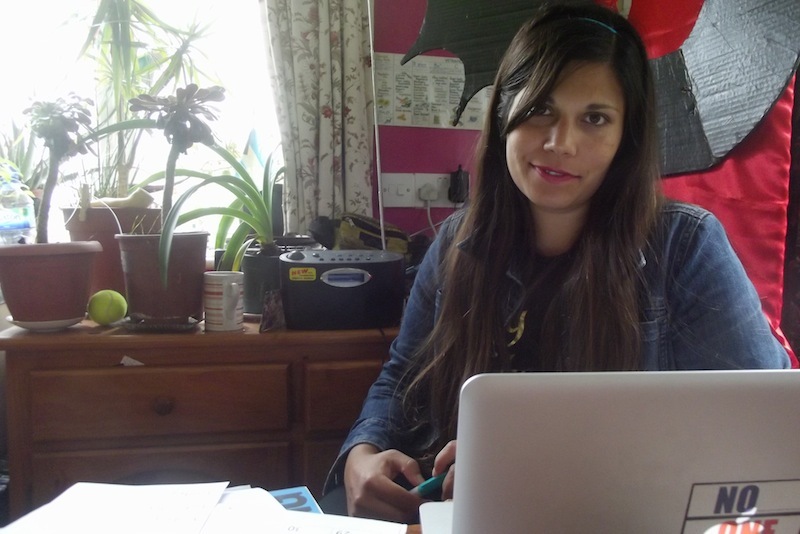 Mary has also worked with Drone Wars UK and ISM in Palestine. Send messages of love and support via her Facebook, or to us, and we will pass them on.